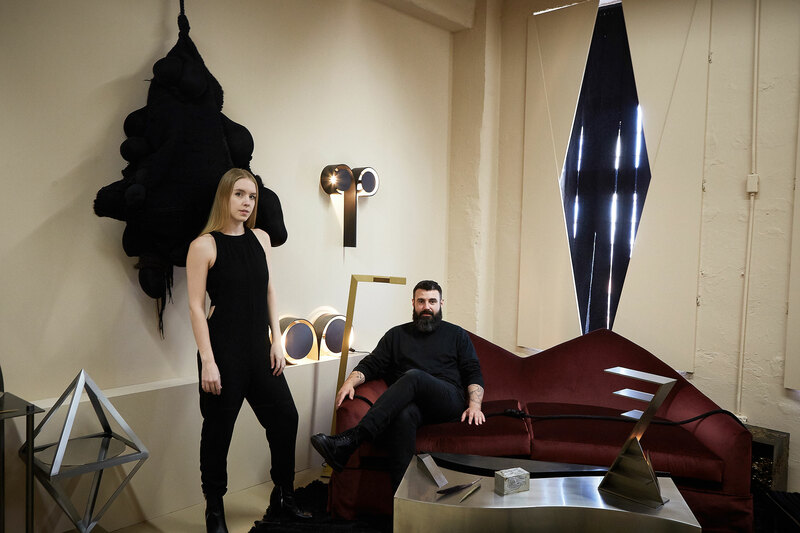 Material Lust is the product and interior design firm of Christian Swafford and Lauren Larson who together strive to design a conversation around ominous aesthetics and identity in a movement they have coined oppressionism. Oppressionism is the combination of heavy-handed theatrics with high design alongside the exploitation of uncomfortable and often pornographic imagery. The work of Material Lust is not meant to be pretty but illuminate the darker side of furniture and interior design. Working on carving out their own lasting space in artistic history, the duo is never satisfied. The quality of their work not only serves to prove that, but demands it. How was Material Lust born? Christian had started Material Lust before we had actually met, but it was totally different. It was avant-garde with a super aggressive political tone…amateur hour. After graduating from Parsons where they tell you how to do everything, we thought we had a good sense of how to conquer our careers. After time working in the interior design field, both feeling creatively drained, we as a couple decided to turn Material Lust into a much needed creative outlet for our own sanity. A space we could be artists masquerading as designers. A creative outlet with roots that came from growing up in the studio with fine art painters for mothers. What is the main purpose of your work? We think of it as art first. The forms. We could never just design something that is going to be functional and beautiful. We spend a lot of time thinking about art history and design history, referencing things like Egyptian hieroglyphics. We want to reconcile where our pieces fit in the timeline of design and art. We want to carve out our own period of time, a time where we were creating what was happening around us and what was going on in the world. We want our work to continue demanding this lasting movement and to retain its characteristic concept through constant artistic evolution. Do you guys have certain standards that you hold yourselves to as artists and designers? We have very high standards and they are never met. We always say our pieces are heirloom pieces. Our work is never going to be thrown out because you found a different coat rack. Even if it is left out on the street, someone that knows nothing about art or design is going to pick it up because they will realize it has some kind of inherent value. That is because of their overexposure to Target, Kohl’s and other mass market furniture brands. Does this help you stand out from competitors—the quality? As product designers we have spent a lot of time working for other companies making stuff in China and India. The problem with these countries is they have the substandard materials. You are already fighting an uphill battle. We do as much fabricating in Italy as possible as they still have that artisanal quality that is lost here. Italian artisans have passion not only because they feel they are creating art but there is pride in the generational roots of their craft. It is all high-end and professional. Hopefully the investment and risk we’re taking will pay off later. What is the greatest reward about what you are doing? We don’t see milestones and take a step back to revel in what we have accomplished. This is actually a problem that we have. We never do that. We are always on to the next mountain to climb. Once we have banged out a collection, instead of thinking about how we completed this amazing collection we move on to another one right away. We always say, when we are on our deathbed we will have the time to reflect on all the work we did. Thank you, Christian Swafford and Lauren Larson for giving a glimpse into an alternative art scene and ideology rumbling just below the surface of mainstream New York City. For more information visit their website: www.material-lust.com, or check out their Instagram: @materiallust.